How to improve the inventory turnover rate in every point of supply chain: supplier-manufacturer-distributor-retail? Implementation of the Theory of Constraints (TOC) tools, especially the Dynamic buffer management allows to considerably improve the inventory turnover and business performance rates. Inventory turnover is the estimate indicator. In order to choose the methods of influence on it, let’s remember how to estimate the inventory turnover ratio and what role does this indicator plays. The inventory turnover formula obviously demonstrates that two directions should be used: increasing the sales and optimizing the average monthly stock. Let’s focus on the stock as the sales is a separate big topic, which we won’t discuss in this article. While analyzing the performance indicator, the Overstock is estimated and controlled. 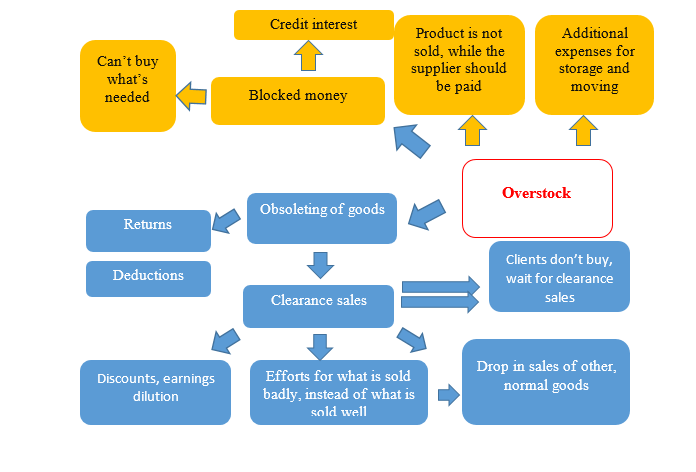 High Overstock level has an adverse influence and a company having a high overstock level is forced to suffer from the multiple adverse events (AE). Which are the Adverse Events in case of surplus inventory? Inventory turnover acceleration due to the decreasing level of surplus inventory allows to solve either obvious or hidden problems. Mainly, it’s the blocked money. Consequently, a company cannot purchase the goods that are sold well and bring in profit as there are simply no money to do it. It also bears additional interest costs if the money are the credit ones. Obsoleting of goods, which can be either physical (expiry dates in food products) or moral. For example, in case of a computer hardware, obsolescence of a model goes within 2-3 months. Obsolescence of the goods results in deductions and returns, and these are the direct losses and logistical logistic expenses. In order to somehow decrease the losses, companies are forced to have the clearance sales. But we should understand that the clearance sales are not the best solution because apart from the fact that the percentage of profitability is drastically reduced, there are also unobvious expenses that are left without consideration. For example, marketing and sales, instead of working on promoting and selling the profit-yielding products, design and implement the mechanisms for the clearance sales of slow-selling goods and goods with close-to-expiry date (promotions, advertising, etc.). More unobvious losses: drop in sales of goods with ordinary prices from the same category as the goods from thr clearance sales. A client, which is choosing either to buy a beer in the clearance sale or at an ordinary price, will most likely choose the lower price. There is one more paradoxical result: the category of clients, which was “raised” to buy the goods only at the clearance sale prices. They don’t buy at a regular price on principle, but wait and look for some promo offers instead. Also, the adverse events include the need to pay for the still unsold goods to the suppliers. It can lead the company to the cash deficiencies and additional expenses for attraction of financial resources. Additional expenses on storage and movement of the surplus goods. Old stock in the retail occupies the valuable space on the shelves and reduces the rate of “turnover per square meter of the shelf”. Distributor has to move the surplus stocks from one spot to another, between branches and warehouses. The other extreme, occurring as a result of stock mismanagement is a shortage (deficiency) of stock of a certain position (Out-of-Stock). It results in the short received sales and loss of profits, as well as losing the regular customers. The companies usually do not completely realize all the above adverse events and surely do not estimate their economic repercussions. Implementation of the Theory of Constraints solution for the inventory management in the chain of supplies will help to accelerate the inventory turnover rate. The main tool is the Dynamic Buffer Management (DBM), which allows to optimize the inventory level, have no surplus of goods, and at the same time, to always have the right product in the right place at the right time. This tool is so unique as it simultaneously affects the numerator (Sales) of our Inventory Turnover Formula and the denominator (Inventory). Thanks to its implementation, the company solves both management tasks at the same time. You can read more about the Dynamic Buffer Management in the article, as well as find out about the automated system ABM Inventory, designed for the inventory management with help of the DBM methods. Accelerate the inventory turnover at 20-30 %. Provide the optimal inventory level without surpluses and shortages. Free money that are blocked in the reserves. Increase sales and profit on average by 15-20 %. Reduce the need for warehouse premises and logistics. Acceleration of the distributed stocks turnover is achieved by implementing the methods of Demand Driven Material Requirements Planning, which incorporated all the best practices of production management: Theory of Constraints (COS), Kanban, Lean, 6 Sigma, DRP, MRP, Innovation. Implementation of the Demand Driven allows not to focus on the sales forecasts, but to manage the inventory based on the actual demand. In order to do it, the response time should be considerably reduced and there should be much faster reaction to the upcoming events. Moreover, the DDMRP methodology removes interdependencies in the production chain that delay the production process considerably and force to keep the large reserves in order to ensure the nonstop production process: specification consists of several products, while the product consists of a set of components, and each element has the insurance stock volume. In the process of DDMRP implementation, the key places of stock holding are revealed, where the buffers are formed, while the rest elements become as free from the surplus (insurance) stock as possible. More about the acceleration of the distributed stocks turnover with DDMRP, as well as the examples of implementations in international companies you can read in the articles and find out at our free webinars. Wishing you a good inventory turnover!